Racumin is a multi-feed rodenticide available in paste and block formulations. Racumin Paste combines vegetable fats and carbohydrates in a way that is exceptionally attractive to rats and mice. Highly palatable Racumin Paste can be used indoors and outdoors in bait stations. Because Racumin is a multi-feed rodenticide, pets and wildlife are less at risk of secondary poisoning. The unique palatability of the soft blocks makes them fatally attractive to both rats and mice. Using the multi feed approach Racumin will kill in a similar timeframe as a single feed bait (3-8 days) without the risk of bait shyness. 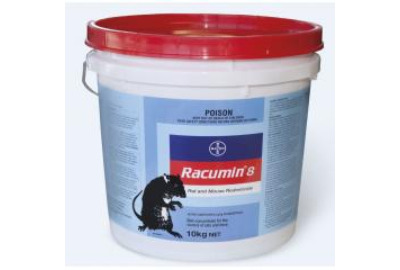 Racumin 8 Rodenticide is a powered bait concentrate used for the control of rats and mice. It contains Coumatetralyl, a first generation anticoagulant that works through a multi-feed system. Unlike second and third generation baits, coumatetralyl is metabolised quickly so dead rodents carry very low residues; this decreases the risk of secondary poisoning to pets or wildlife who may scavenge on the dead rodents. Racumin 8 is unique in its application; it can be used as a tracking powder or dry bait. The tracking powder will result in rodents licking the poison off their feet and fur while grooming, reducing the risk of bait shyness and making it ideal to use when food sources are plentiful. Custom made baits can also be prepared by mixing with grains and seeds to make a dry bait. Racumin 8 can be used around the farm, in industry buildings and crop situations as part of a rodent control strategy. Racumin Paste is a ready-to-use rodenticide bait paste used for the control of rats and mice. It contains Coumatetralyl, a first generation anticoagulant that works through a multi-feed system. Unlike second and third generation baits, coumatetralyl is metabolised quickly so dead rodents carry very low residues; this decreases the risk of secondary poisoning to pets or wildlife who may scavenge on the dead rodents. Using the multi-feed approach, Racumin will kill in a similar timeframe as a single feed bait (3-8 days) without the risk of bait shyness. Racumin Paste combines vegetable fats and carbohydrates in a way that is exceptionally attractive to rats and mice. Racumin Paste is the ideal bait for domestic use and for use around the farm as part of a rodent control strategy. 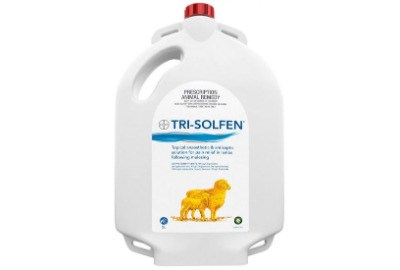 Tri-Solfen is a local anaesthetic and antiseptic gel spray for use on lambs to provide pain relief following mulesing. It has also been developed to reduce blood loss and infection in order to improve wound healing. The product contains two proven topical local anaesthetics; fast-acting Lignocaine for immediate pain relief and long-acting Bupivacaine for prolonged post-operative pain relief. Adrenaline is included for its ability to reduce the shock and stress of blood loss, whilst prolonging the anaesthetic action. Tri-Solfen also contains Cetrimide, an antiseptic widely used to cleanse skin and wounds and provides protection from bacterial contamination. The product's gel base adheres well to the wound and acts as a barrier to environmental stimuli to improve wound healing. Note: Insecticidal preparations registered to treat mulesing wounds can be applied AFTER application of Tri-Solfen. However high volume fly treatments are not suitable to be used as they are likely to wash the Tri-Solfen from the wound. MEAT: Treated sheep must not be supplied or sold for slaughter for human consumption for at least 90 days following treatment with this product. MILK: This product must not be used in lambs that will in the future produce milk or milk products for human consumption. EXPORT SLAUGHTER INTERVAL (ESI): Not established.